This book explores the overlapping role of religion, popular belief, caste system and the state in the lives of people of the Western Himalayan. 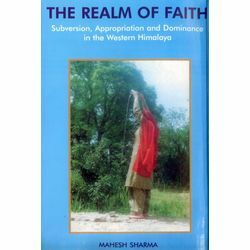 It traverses through the Western Himalayan landscape across the colonial times ( occasionally even earlier times) to determine the protest and subversion against the structures of dominance. Through the process of marginalisation and appropriation the discontent as well as the popular culture is co-opted to fashion the Himalayan social structure. Using fieldwork and archival sources, the author argues that the hope of social revision becomes an alternative to economic subordination. At the same time, the high caste dominance is derived from the denial of symbols of purity, propitious, hierarchy, kingship, and justice to the lower castes. Located in this social tension, the book questions the process by which socio-religious hegemony gets constructed. It delineates the mechanism by which the dominance is constructed by the subtle control of castes, economy and pilgrimage network. A significant feature of this book is that the author has successfully combined the disciplines of history, sociology and social anthropology. As a result of this multi-disciplinary approach this book goes beyond the few studies of similar interests carried out earlier. Not only have traditional and well-known sources of information been used by the author - hitherto unutilised source material has been unearthed and imaginatively presented. This book explores the overlapping role of religion, popular belief, caste system and the state in the lives of people of the Western Himalayan. It traverses through the Western Himalayan landscape across the colonial times ( occasionally even earlier times) to determine the protest and subversion against the structures of dominance. Through the process of marginalisation and appropriation the discontent as well as the popular culture is co-opted to fashion the Himalayan social structure. Using fieldwork and archival sources, the author argues that the hope of social revision becomes an alternative to economic subordination. At the same time, the high caste dominance is derived from the denial of symbols of purity, propitious, hierarchy, kingship, and justice to the lower castes. Located in this social tension, the book questions the process by which socio-religious hegemony gets constructed. It delineates the mechanism by which the dominance is constructed by the subtle control of castes, economy and pilgrimage network. A significant feature of this book is that the author has successfully combined the disciplines of history, sociology and social anthropology. As a result of this multi-disciplinary approach this book goes beyond the few studies of similar interests carried out earlier. Not only have traditional and well-known sources of information been used by the author - hitherto unutilised source material has been unearthed and imaginatively presented.